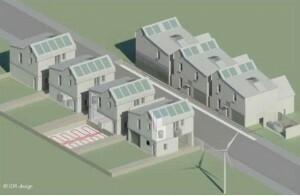 In contrast to large-scale power plants connected to wide-reaching energy grids that provide service to large populations, microgeneration refers to small-scale operations that generate energy, or power, to meet the needs of an individual residence, small business, or small community and that may or may not be connected to a grid. Connecting to the grid can provide revenue for any power in excess of the local needs, as long as the grid allows for connecting and pays for it, often called a feed-in tariff. Such power sources are typically installed to serve consumers who are remote from a power grid or to rely on renewable energy sources when the larger power grid is relying on fossil fuels. Microgeneration can involve supplying electricity or heat, or both. Technologies used in microgeneration are commonly available and include wind turbines, hydro power, solar systems, heat pumps and combined heat and power installations. Microgeneration provides the opportunity for an individual or community to exercise ownership over its source of energy, and to determine the form and sources of the energy used. Notably this usually involves renewable sources of energy rather than fossil fuels, and communities are often less opposed to wind turbines when they share ownership of those turbines. Identify a microgeneration facility in your area and determine whether it is providing all the energy needed at a cost less than what would be paid to the local grid operator. Explore the economics of installing a source of renewable energy that would provide your home, business or community with sufficient power for all your electrical equipment and appliances and devices. Explore the feasibility and costs and benefits of connecting a microgeneration facility in your area to the national grid.